The all-new TWS HIRE safety specific trailer mount watercart of 1,200 litres capacity is ideal for smaller landscape or construction projects accessed by narrow driveways, or other sites that may present a challenge for larger vehicles. 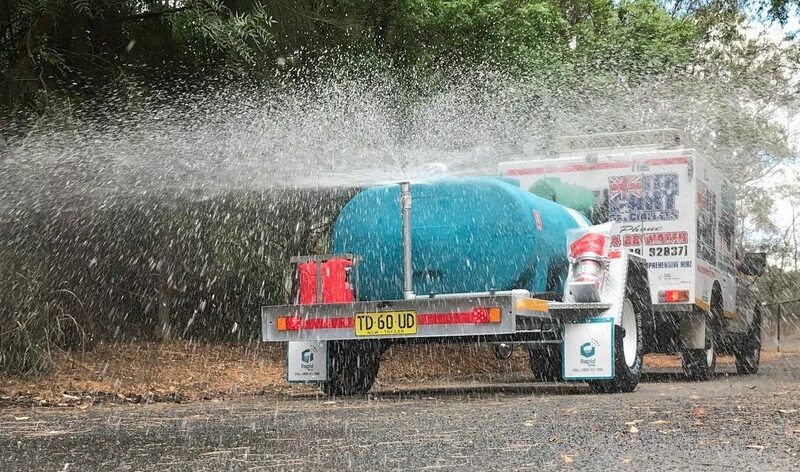 This versatile, high performance trailer watercart performs all water spraying functions and can be comfortably towed behind your ute. Manufactured with a specially designed high clearance robust chassis for rough terrain, it features a rear water spray deflector, 35 metre hose with nozzle, multiple outlets for customised set up, wheel nut indicator, fire extinguisher and all safety decals and labels. There is a 50mm tow ball, override brakes and handbrake (no electronic brake control is required), a fully baffled, high pressure Honda pump, full NSW road registration, overhead filling with a garden hose and a two inch lay flat hose. This equipment is delivered with all insurances. Risk assessments in digital or physical manual format are available on delivery. Units are available with a Sydney Water standpipe, together with all permits. Trailer watercarts a available for immediate delivery in the Sydney metro area.